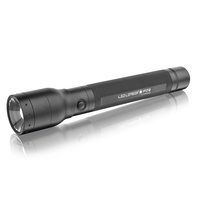 he P17R is a durable flashlight with 400 lumens on high and a remarkable 10 hours of run time. This handheld light features the Advanced Focus System™ for both long-distance spot and up-close flood lighting alongside High Power LED technology. The P17R comes with two LI-FEPO4 rechargeable batteries so it won’t let you down, even in the most rugged environments.